It would appear that the window profile on the C-pillar of the new Cadillac CT5 sedan is being outdone in the quality department by none other than the humble Honda Accord. The new Honda Accord is a good car, and while I hope the new Cadillac CT5 is also a good car, it’s window profile, with that new pointy beak crease behind the rear door window, is letting me down. I know we’re all tired of the “this car looks like that car” discussions that crop up every time there’s a new sedan or crossover, but I mean, look at that. The Cadillac and Honda share very similar pointed window trim treatments, both designed to house what appear to be a third window for the cabin behind both of the windows in the front and rear doors. On the Accord, this is very obviously a real window, with real glass that you can look out of as you rest your head on the rear headrest. On the Cadillac, it doesn’t look like it’s a real window at all. Not only did Cadillac opt to split the window in the rear door into two elements, which lets you roll the forward part down all the way instead of leaving a bridge of glass, which keeping the window whole would have done, but it also looks like the “third window” in the side profile isn’t a window at all. Just for the sake of another comparison, the new 3 Series found a way to forgo the third window treatment altogether, curving the door glass to cut into the C-pillar instead. It seems most designers are trying to avoid the vertical line you get by cutting the door glass apart. I’m pretty sure, judging from the photos released today, the area filling the pointed trim piece of the window profile on the CT5 is just a giant panel of black trim material. It may actually be glass, but I’m almost positive you can’t see through it. So, not only did Honda achieve a cleaner design by not splitting the rear door’s window into two elements, but it also managed to squeeze in a real window behind the door. In contrast, Cadillac’s design looks busy and dare I say budget, at least in that little corner of the car. 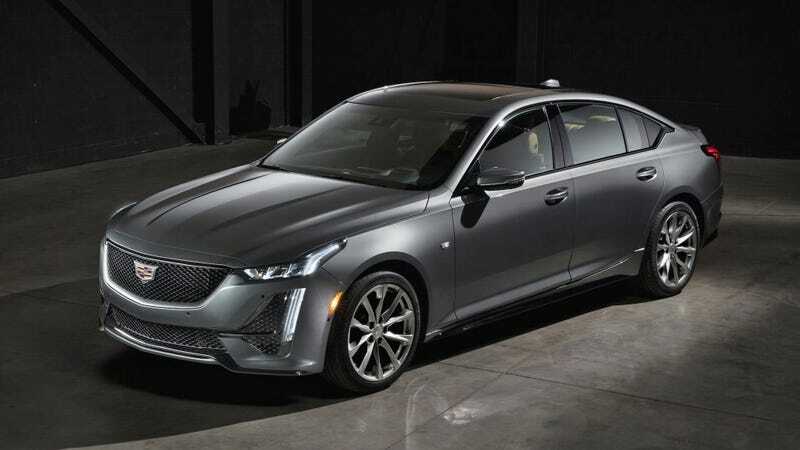 I’ve reached out to Cadillac to confirm that there isn’t some weird, dark black hole of a window there that’s just tricked by photos on the internet, but I’m pretty sure it’s just a sea of trim. Anyway, congrats on your COTD win, featherlite, and good eye.